I noticed a troubling detail about the Kindle Fire this morning that, on further reflection, is rather important. 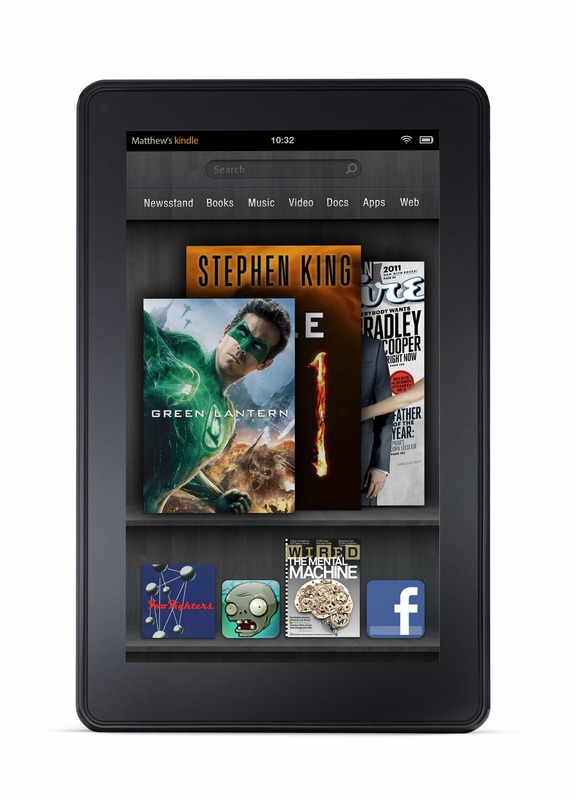 The Kindle Fire started arriving yesterday, much to the delight of gadget lovers. As you probably know, this 7" Android tablet is supported by the Amazon Appstore, which has thousands of paid and free apps in it. You can even find a few competitor's reading apps in the Amazon Appstore. For example, Kobo had their app in there since Amazon launched the Appstore, and the same goes for Aldiko. You can also find Wattpad, ReadItLater, Bluefire, and other reading apps. Here's the interesting part: you cannot see most of those apps when browsing the Amazon Appstore from the Kindle Fire. I've spent the morning double checking, and it looks like Amazon pulled a sleight of hand with the new Kindle Fire. I can confirm that Bluefire Reader, Kobo, Wattpad, and Aldiko cannot be found via the Kindle Fire. The apps are still there, and they will likely still work. But Amazon won't provide them to you. You'll need to find the app elsewhere. Update: Wattpad just announced that their app is now available on the Kindle Fire. I cannot see it, and according to the listing page that app is not compatible with the Kindle Fire. I will update this post if that changes. Now, what this usually means is that Amazon doesn't think the apps are compatible. I've encountered hidden apps with any number of Android tablets and usually Amazon is right; the apps won't work. But not in this case. I went looking and found several of the apps elsewhere. I can confirm that Kobo, Aldiko, and Wattpad work just fine on the Kindle Fire. Second Update: I've just been told by Bluefire that their app had been tested for the KF when it was submitted to Amazon. Amazon told Bluefire that the app was compatible, so there's absolutely no reason for it to not be listed. Amazon is hindering their competition from their tablet. Pretty slick trick from Amazon, isn't it? Sure, they allow their competitors to upload an app to their app store, but that doesn't mean Amazon actually has to list it. And since none of the apps released by Amazon's direct competitors are listed for the Kindle Fire, it's going to be a kinda hard to install and use them. Now, this is only beginning to bother me. I mentioned this is a footnote to a post this morning, and I didn't think it was important at the time because I could still install the apps. But now that I've seen how thorough Amazon was in blocking their competition and the underhanded manner in which they did it, it reminds me that Amazon is only pretending to be customer oriented. They won't hesitate to trick you if it suits their best interest. On the other hand, I can still install apps found elsewhere, and that puts the Kindle fire a step above the Nook Tablet and the iPad. B&N doesn't even carry competing reading apps, and Apple is Apple. I'd say both are worse than Amazon in this regard. Pretty sneaky I’ll grant you but it doesn’t restrict you from installing them so for those who absolutely must have their Kobo they can still get it. I would assume this is mostly due to the cost of the Fire and the need to drive sales thru the Kindle Book Store. Resolution of the app on your home screen looks like crap if it wasn’t downloaded from Amazon’s AppStore to, so much much so, I’ve read post where people were deleting them because of this. Yes. That could be another part of Amazon’s ploy. I solved that by installing my own launcher – Go Launcher. Didn’t even need to root! I see this simply as good business, frankly. Honestly, think about it: how many times do you drive into, say, a gas station and find local competitive gas prices listed? Fact is, you don’t. No company ever wants to actively promote their competition, which these apps would most certainly do. Amazon has no obligation to make it easy for us to buy content from other stores, and indeed it has huge incentives not to do so. And as we know, they’re not selling the Fire to make money on the hardware (as opposed to many other tablet vendors), but rather to push purchases through Amazon. Bottom line is, if you’re a consumer who wants to easily purchase and consume content from a variety of outlets, then don’t buy Kindles or Nooks. I bought my ASUS Transformer specifically to read ebooks from all four of the majors, and I do so regularly. I’d never even consider buying a Kindle or Nook for the same purpose. Today, Amazon lists Hulu and Netflix apps for the Fire, if I’m not mistaken. Mark my words–once their own video offering is more robust, I wouldn’t be surprised if those slowly disappear as well. That, or Hulu and Netflix simply have too loyal a base of customers, which Nook, Kobo, Google, etc., don’t have. yes, but that doesn’t mean the customers can’t be upset about it. Sure, and that’s what’s great about living in a (semi-) free country: there are many other choices. In fact, I’ve been arguing for some time that the Kindle and Nook Color/Tablet are simply NOT the same thing as the other tablets, and shouldn’t be looked at the same way. The iPad is a bit of a mix, really, in that Apple both wants to sell their incredibly high-margin hardware as well as sell the content. But, Apple’s the only one who can get away with that (so far). Mark, yes, and Amazon *announced* partnership with Netflix, so they’d hardly be planning to hide it. It makes BEING at Amazon more attractive, so it’s a business decision to incorporate it. They announced Netlfix and Pandora, etc., during the launch of Kindle Fire Sept. 28. Nate, better to direct your being-upset to where, in the real-world of business, Amazon’s actual action is TO ALLOW installation of apps from competitors (w/no charging of book sale fees) while B&N will not allow installation, at all, of apps from competitors or even most non-B&N apps. In other words, if you want something that much, do it yourself because they won’t stop you, but maybe require you to use some initiative for something you want that they don’t themselves offer. B&N, however, will not allow it, nor will Apple. Everything in proportion unless you want to be upset all the time. B&N proclaimed they were more open than Amazon. With their restriction of internal storage area to 1 gig for customer’s own non-B&N files, which Engadget finally noticed, which store is more ‘open’ ? It was B&N that brought this up. I won’t be upgrading my NookColor to NookTablet. AM looking at the Asus Transformer Prime though. How does one sideload other peoples apps and ect. You can email the app to yourself and then open the email on the Kindle Fire. Or you can go to a website that hosts apps (Freeware Lovers, for example) from your KF and then download the app direct to your KF. Or you can copy the apk file via usb, install a free file manager (there are several in the app store), and then locate and activate the file. It’ll install nice and easy. Personally, I think Amazon should have the courage of their convictions and allow all Fire-compatible applications to be visible to Fire owners. As is, they are devaluing their App store and inconveniencing Fire owners to little benefit. Novice Fire owners will most likely be happy with the onboard apps and even if they install Kobo or another ebook app, what are they going to find? Equal or higher prices? It might even reinforce their satisfaction to get a FIRE knowing the competition is not any better. More advanced Fire owners will only be slightly inconvenienced but they *will* take note of this bit of pettiness. Cause, frankly, that is all it is; a bit of childish pettulance that is generally beneath them; after all you can buy (refurbed) NookColors from Amazon along with other competing tablets and ebook readers. On a scale of one to ten, with one being “meh, no biggie” and ten a full showstopper, I’d say this is about a five; “needlessly annoying”. For comparison, B&N totally locking down their tablets to prevent all sideloading is an eight and Apple’s shakedown a full ten. Definitely something for the app providers to take Amazon to task over; either the device is open or it isn’t–either the appstore promotes what it carries or it doesn’t. It is petty and stupid and the kind of anti-competitive thing that brings in government bureaucrats sniffing around, just what Amazon doesn’t want. I suspect this will be billed as a glitch and promptly “fixed”. I have no problem using the Kindle App on my Nook Color – only took me about 20 minutes to “unlock” it. Downloaded and installed the Amazon Market app and everything has worked just fine……and still get my free wifi at all the B&N stores! You have to root to do this. Amazon might not allow Nook in their store but you can side load it without rooting..
I’m still not sure what I feel about the home screen. I don’t like my recent Apps or webpages.. (especially web pages) on my home screen. I wish I could just stick my favorites in the carousel. So “Apple is Apple”. Yet you can still download Kindle for iPad. You can still download “1 million FREE Books – Read eBooks!” (which is a _very_ tacky name for Kobo). I can’t really see how this puts the Fire above the iPad. Did you forget the BS Apple pulled with the in-app purchase? Thanks for the great, informative post. I’m not particularly astonished by this, neither can I blame Amazon as “business is business”. However, transparency is a must. At least they haven’t blocked the apps entirely. Yet.